← The Natural Victim is finally done! When I started working on The Natural Victim I decided to keep a record of the dates and times I worked, as well as the overall word count. Now that the book is out, I had some time to go back and use that record to get a better idea of what it takes to write a novella. I’ve put the numbers into a few graphs. Hopefully, this might help a wannabe author get a better idea of what to expect when working on a book. Here then is a behind the scenes look at the writing of The Natural Victim in pictures and numbers (and words). Number of days worked on the book – 90. I set out to write the book in 90 days and I did it! Of course, towards the end, I wasn’t even paying attention to this goal, and I’m pretty sure I missed recording a day or two in between, but according to the record I worked exactly 90 days. Number of hours worked total – ~92. Number of minutes worked per day – ~62. I rounded both stats to the nearest whole number. The figure on the right shows the minutes per day in pretty picture form. 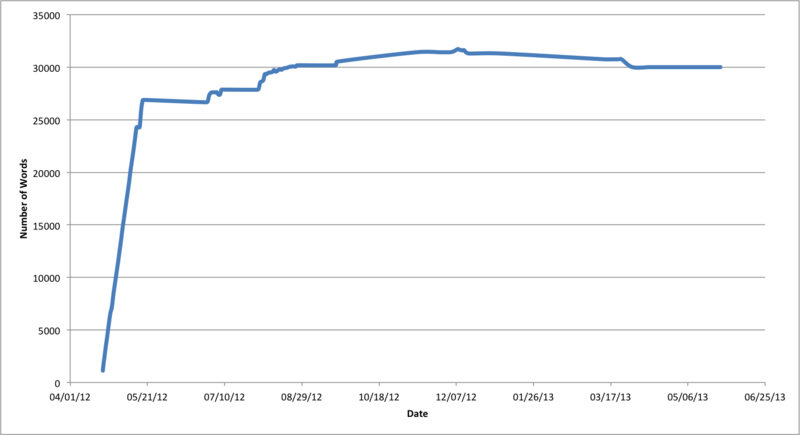 You can tell by the rises and dips where I started and finished my various drafts. I was pretty consistent with my first draft, working about an hour each day. An hour is about what it took me to write a 1000 words and that was my goal. The large spike towards the end is the first day I spent on formatting the book, and it took me a while to get set up and get everything going. Word count over time. You can see where my first draft ends (after that steep climb), and then the slow increase till about the fourth edit when the word count starts to slowly decline again. Many people write a lot and then cut. I found myself not writing enough and having to add stuff. 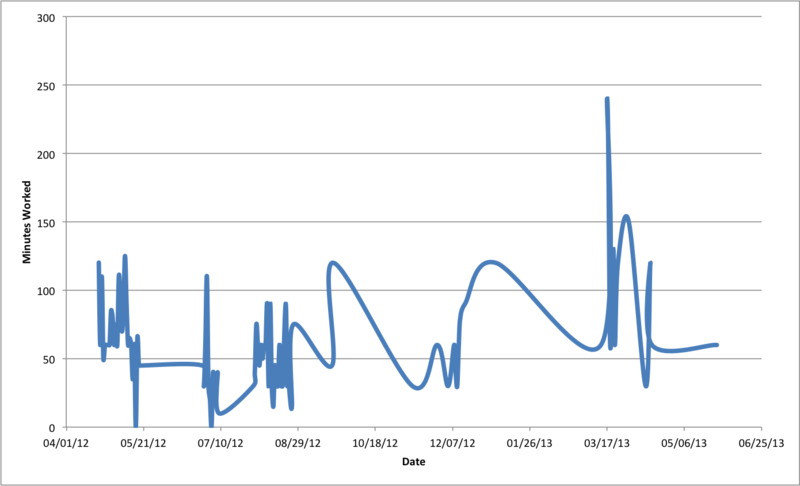 Change in word count over time. 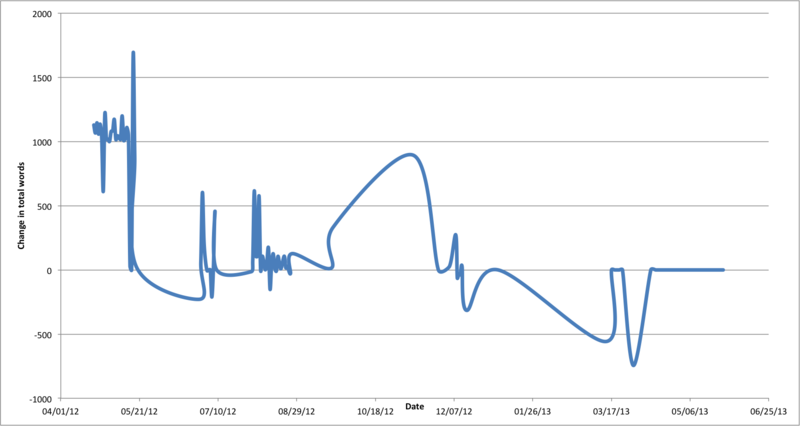 Change in word count over time. During my first draft, I was consistently writing 1000 words/day and then it dropped when editing started. The bump in the middle was during my third edit (fourth draft) I believe, when I realized I really needed to have more words when setting a scene instead of jumping in immediately. Breakdown of time spent. 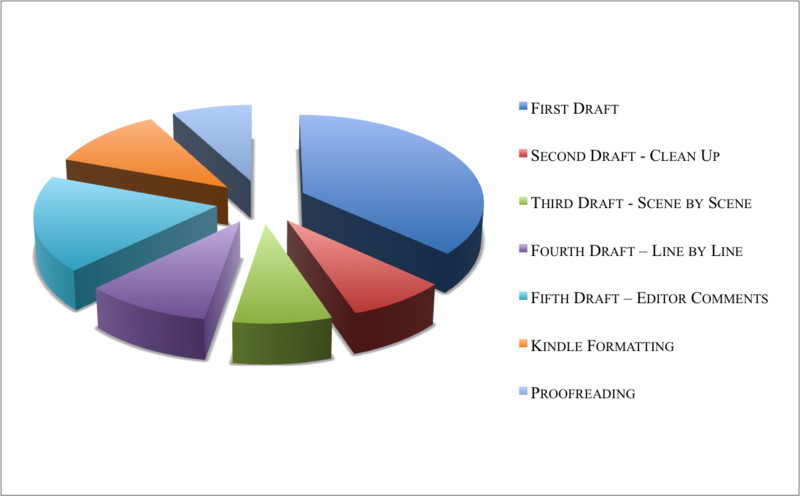 The single largest chunk of time was spent on the first draft. But when compared to overall time spent, that first draft only took about 37% of the total time I spent on the book. The chart does not show the time spent on the book by my awesome editor who also happens to be my beautiful wife. Without her the book would have degenerated quickly into a menagerie of orphaned oxford commas, typos, flowery language, and even a plot-hole or two. Number of edits – 6. I combined a couple of them into a single edit in the breakdown. I also did two proofreading sessions that I combined into a single pie slice. Again, these do not include the edits by my editor. Miscellany. Editing took way more time than I had imagined or really set aside for initially. In a way it was good that I wrote a novella instead of a novel. I don’t think I would have finished it in 90 days otherwise. As a rough estimate, I think a time breakdown of 1/3rd for the first draft and 2/3rd for the editing is a good plan. I hope to blog more about this in the next week or two including the results of putting my book up on Kindle Select and making it free for 5 days, an awesome review that was sent to me, and a list of what I learned doing this book. One final plug/reminder. The book is free for another day (till June 7, 2013) on Amazon, so if you haven’t picked it up yet, this is your chance. For those of you who have downloaded the book already, a big thank you, and when you are done, please send me your thoughts via email or put it up on Amazon or Goodreads. I would love to know what I got right and what I can improve on. Posted in The Natural Victim and tagged stats. Bookmark the permalink. Peter – This is really interesting! You’ve made it so clear the kind of work required to put a story together. And the charts are great. Thanks Margot. It was fun taking all the numbers and seeing them flow out on a graph. It’s also a great way to see how I’m progressing as I work through a draft or when I need a little inspiration. How interesting! I particularly like the pie graph–the ability to break down the time spent per draft is fantastic. Thanks for sharing!